The discovery of a previously unknown ancient tomb in Egypt is not that uncommon. Scroll back through the Ministry of Antiquities’ Facebook page (here) which it uses to circulate regular reports about its activities and you will see brief reports on numerous such discoveries made in recent weeks and months. Highlights include the revelation of the tomb of Ramesses II’s army general, another belonging to a Goldsmith, the pyramid of a Thirteenth Dynasty princess, and even a workshop where the bodies of the recently deceased were mummified. Just this week it was announced that the burial chambers of two high officials of the Middle Kingdom had been found at Beni Hasan in Middle Egypt. Egyptian archaeology can sometimes seem relentlessly thrilling. The fact that the discovery of the black sarcophagus was made in Alexandria piqued my curiosity more than most such stories however, as I have recently been writing about the possibility that the tombs of two of the most famous figures in the ancient world might yet be awaiting us in this part of the world: Alexander the Great and Cleopatra. Whoever had been buried in this sarcophagus was, it seemed, still in there, undisturbed. It seems to me that intact ancient Egyptian tombs are the archetypal archaeological discovery, at least as far as the popular imagination is concerned. 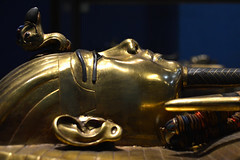 Howard Carter’s excavation of the tomb of Tutankhamun represents the ultimate, real life example (although pedants will note that in fact that tomb wasn’t quite intact, having been entered shortly after the burial and the contents slightly disturbed), and the inspiration for countless fictional discoveries since, from the setting for the start of various The Mummy movies, and (how could I fail to mention) the opening to the classic Dr Who story, The Pyramids of Mars, among many other films etc. Professor Marcus Scarman enters an ancient Egyptian tomb at the beginning of the Dr Who serial Pyramids of Mars © BBC 1975. This new tomb in Alexandria was never going to be quite like that however. In this case, it was not the tomb – which seems to have been composed of a shaft of 5m depth, and not much more – but the sarcophagus, that was intact. I’m often asked to provide comment on news stories like this for television and radio. To be honest it can be quite difficult to add anything very insightful because we specialists usually have little more to go on than the very sketchy information provided in the press. We are accustomed in our own research to referring to far more detailed reports and it often feels a little unnerving being asked to comment publicly without knowing more. But that’s how it works, and we do our best. The tomb seemed to consist of a simple, if quite large shaft, rectangular in plan and of 5m in depth, but not much more. This was undecorated (as shafts usually are). Image of the shaft (at bottom right) taken from a video posted to The Guardian online via YouTube (here). This photo does a better job than most in circulation of showing why it is so difficult to recover much of the archaeological evidence of ancient Alexandria: the ancient city now lies underneath the very densely populated modern city. This shaft came to light when one of the local inhabitants was excavating the foundations of a modern building. It’s very likely that there is still much more underneath other buildings like the ones shown here. The shaft was found in Al Karmeli Street in the Sidi Gaber district to the north east of the main harbour, a little way outside the area we believe the major royal buildings of the Ptolemaic Period to have been located. Satellite image of Alexandria showing the location of the black sarcophagus (the green pin). To explore this Google Map of the location of key ancient sites go here. 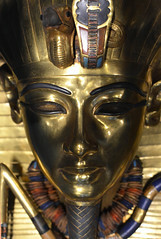 We were told that the burial was thought to date from the Ptolemaic Period (323 – 30 BCE). This seemed reasonable to me. The burial couldn’t have been made much earlier than this: Alexandria was founded by Alexander the Great in 332 BCE on an earlier, much smaller settlement called Rhakotis, but didn’t really take shape until building got underway during the reigns of Ptolemy I Soter (reigned 323–283 BCE) and his son and successor Ptolemy II Philadelphus (283-246 BCE). This shaft burial was very unlikely to have been older than the Ptolemaic therefore. The sarcophagus itself may have been a little older however. It was made of a black granite, a hard and expensive stone, and was very large indeed (265 cm in length). Its lid is of a common Late Period (26th – 30th Dynasty) type. While the underside is flat so as to sit flush on top of the sarcophagus basin beneath, its upper surface reaches a greater height at the head end so that in profile it slopes upwards. Looking down onto the lid one sees a central column which from left to right is horizontal to the ground, but either side of this the surfaces slope downwards, so that on end the lid takes on a trapezoid shape, like a pitched roof with a flat central section. The head end of the lid is curved. 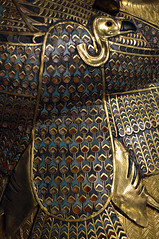 Image of the sarcophagus lid still in place in the shaft. Copyright Ministry of Antiquities, taken from the announcement here. Metropolitan Museum of Art, New York, the sarcophagus of Wereshnefer, Dynasty 30–early Ptolemaic Period, from the tomb of Wereshnefer, Saqqara. Further info and more images here. Metropolitan Museum of Art, New York, the sarcophagus of Wennefer, Dynasty 30–2nd Persian Period, from the tomb of Wennefer, Saqqara. Further info and more images here. Sarcophagus of an Apis bull bearing an inscription of year 2 of pharaoh Khabash, a rebel who led a revolt against the second wave of Persian oppressors in approximately 338 to 335 BCE. In situ in the Serapeum at Saqqara. All of these are dated approximately to the Late Period i.e. the period around or immediately before Alexandria was created. So how could a Late Period sarcophagus end up being used for a Ptolemaic-era burial? There is a simple explanation: sarcophagi such as this would have been extremely expensive, and only the very wealthiest would have been able to afford to commission a new one of their own. There are, unsurprisingly therefore, lots of examples of sarcophagi such as this having been re-used. In this case it’s not difficult to imagine that the sarcophagus was made during the Late Period but was perhaps abandoned and then re-appropriated at a later date, perhaps bought for a knock-down price from the quarry or workshop where it was cut, and transferred to Alexandria after it had come into being as Egypt’s capital. The abandonment might also explain another of the features of this particular sarcophagus: it was undecorated. This is a great shame as any inscriptions would probably have provided the name of the owner and perhaps a little information about him or her. Even better, a name might have allowed us to connect the deceased with sources elsewhere, allowing us to flesh out their story. So who was buried inside this sarcophagus? While the sarcophagus may have been intact insofar as it hadn’t been violated by robbers it seems the mortar seal had not been sufficient to prevent the ingress of dirty water from a nearby leaky sewage pipe. All that was left inside apart from a pool of stinking red-brown water, were the skeletal remains of three separate individuals who, it has been suggested may have been soldiers, owing to one of them exhibiting signs of having suffered an arrow wound to the head. Whether there will be more to learn about who these people were, beyond their gender, age, cause of death and perhaps their relationship to one another, remains to be seen. Not the tomb of Alexander the Great … So where was he buried? One thing we can be fairly clear about now is that this was not, contrary to suggestions made by some observers, the tomb of Alexander the Great. It seems likely there was some great monument built to house the body of this great figure, it was probably in Alexandria, and it’s never been found so it’s perhaps not surprising that any discovery of a monumental tomb in the city would prompt such speculation. Writing a book called Searching for the Lost Tombs of Egypt as I have been for the last couple of years has turned out not to be great for my nerves, given the frequency with which new tombs are found. Every time a new discovery is announced I get a sinking feeling: what if they find one of the tombs that my book says are currently missing but might soon be discovered? In this case, fortunately, I knew I had no need to worry. A number of classical texts tell us that Alexander was, ultimately, laid to rest in a mausoleum in Alexandria known as the ‘Sema’ or ‘Soma’ a very grand monument built to house not only his burial but also those of his successors, the Ptolemies. This great edifice was built during the reign of Ptolemy IV Philopator (221-204 BCE) and was still standing at least a few centuries later when, we are told, it was visited by the Roman Emperor Caracalla (198-217 CE). The sources are frustratingly vague about its location however, and no trace of it has ever been found in the archaeological record, leading some to speculate that it may yet await discovery. Alexander’s body must also have lain somewhere else in the decades prior to the construction of the Sema, presumably in an earlier tomb perhaps dedicated to him alone. Various anonymous tombs of approximately the right date, and of Macedonian, rather than Egyptian, style have been suggested to have been the first Alexandrian tomb – the grandest monuments at Shatby, and the ‘Alabaster tomb’ are of Macedonian style and the right approximate date – but again the clinching evidence has been lacking, and for most scholars there is no surviving trace of this earlier tomb either. The recently discovered shaft and sarcophagus certainly did not fit the descriptions we have of the Sema. Some might have thought it another candidate for the earlier tomb but if this one ever is found it will surely not be sealed as we know Alexander’s body was moved from it to the Sema. Still, I wasn’t surprised that Alexander’s name was mentioned in all the speculation prior to the sarcophagus being opened, and I wasn’t unhappy about that either. As I’ve noted elsewhere, Egyptology thrives on sensational stories, particularly the possibility that something thrilling like an ancient celebrity’s tomb might be discovered, and I don’t see any great harm in this kind of speculation provided such claims can be effectively rebuffed by those with specialist knowledge (as was the case in the film here, a representative of the Ministry of Antiquities quickly quashing the idea). The sarcophagus also reminded me of a favourite object of mine, which is perhaps the closest thing we have to the evidence of Alexander’s tomb. In 1798 the British defeated Napoleon’s army in the ‘Battle of the Nile’ in Aboukir Bay, around 30km north east of Alexandria. Having seen off the enemy the British set about taking charge in Egypt. One aspect of their business was the seizure of the choicest antiquities which the French had been collecting. The most famous of these was a lump of granodiorite, the remains of a stela of the reign of Ptolemy V bearing a text written in three scripts: the cursive, handwritten form we call Demotic, and the more formal hieroglyphic script (both used to write the ancient Egyptian language), and ancient Greek. It was found to have been re-used as part of masonry of a fort near the town of Rashid or ‘Rosetta’ and is now known as the ‘Rosetta Stone’. At the time, another potentially important object had come to the attention of the British authorities. They had heard that the French were in possession of ‘the tomb of Alexander the Great’. This turned out to be the basin of a very large sarcophagus of the pharaonic period. It was found within the courtyard of a mosque, el-Attarin, in the centre of Alexandria, and had been known as Alexander’s tomb thanks to a local legend that was at least a few centuries old by that time. At this point, at the turn of the eighteenth and nineteenth centuries, the decipherment of the Egyptian language was still a couple of decades away. The Rosetta Stone is now world famous because its inscriptions allowed Jean-Francois Champollion to decipher the ancient Egyptian language and, from then on, for the vast quantity of ancient texts that were already known by that point to be read for the first time in the modern era. When this knowledge was applied to the sarcophagus from el-Attarin mosque, which had by that time made its way to the British Museum, it became clear that it was in fact made for the last pharaoh of the 30th Dynasty, Nectanebo II. So not Alexander’s sarcophagus after all. Or could it have been? As mentioned above, there is plenty of evidence for sarcophagi having been re-used…. Nectanebo II was the last ruler of pharaonic Egypt. His reign came to an end when he was ousted by Artaxerxes III, the first ruler of a second wave of Persians to take control of the country. He was said to have fled to Nubia and never returned to Egypt. The Persian Empire was Alexander’s great enemy, and it was Alexander who, in defeating them, liberated a very grateful Egypt from their rule. The three Persian emperors who ruled the country during that brief period, Artaxerxes III, Artaxerxes IV and Darius III, were hated in Egypt. In the period immediately following Alexander’s death in 323 BCE in Babylon there was considerable uncertainty about how and where Alexander should be buried and who should succeed him as ruler of his vast empire. It seemed that responsibility for burying Alexander would rest with whoever was to be his successor. Ptolemy, an army general who had been one of Alexander’s closest confidants, wanted to take charge of Egypt, and made a decisive move in autumn 321 by stealing the body before any of his rivals could do anything about it. Having brought the body to the Egyptian capital at Memphis Ptolemy sought to capitalize on Alexander’s popularity with the Egyptians by drawing a direct connection between the great man and Nectanebo. In one legend, perhaps created or at least encouraged by Ptolemy himself, Nectanebo visited Macedon after the Persian invasion in the guise of the Egyptian god Amun, and seduced the Macedonian king Philip’s wife who subsequently gave birth to a child: Alexander. How very convenient for Ptolemy in his attempts to become the legitimate ruler of Egypt, that Alexander’s father should have been at once both the last native pharaoh, and also Egypt’s premier god. In order to seal the deal for himself Ptolemy needed to give Alexander a full and proper burial in Egypt, and having been pursued there by his rivals he must have known he had little time. But where to find what he needed to create a suitable monument to receive the body of his master? In the normal course of events when a new pharaoh came to the throne one of his first acts would have been to commission a grand tomb for himself, and everything to go in it, including a monumental sarcophagus. Nectanebo would have been no different – his sarcophagus was probably made relatively early on his reign. But of course it never served its intended purpose, because Nectanebo was chased out of the country never to return. Could it simply have been lying around unused? If so, what better receptacle could there have been for Alexander’s body than a sarcophagus created for his mythical father? And when the newly built city of Alexandria was finally ready to receive the body of its founder a few years later, could it have been transported in that very same sarcophagus? Is that how this object came to be in the courtyard of el-Attarin mosque. And could the legend that this was ‘Alexander’s tomb’ in fact have been based in truth? Searching for the Lost Tombs of Egypt will be published in the UK on 11 October 2018 and in North America on 28 November. Pre-order from Amazon here. *My writing on Alexander’s tomb, here and in the book, draws extensively on the work of Andrew Chugg (here) and Nicholas J Saunders’ Alexander’s Tomb in particular. Hi Chris -great article. To add to it I read somewhere (and of course the one time I want to recall where ????? ?- LOL) in one of the academic works that Howard Carter gave some indication that he thought he knew where the Sema was but ‘was going to take it to the grave with him’ – as we Egyptologists always love to do. Whether it’s real or supposed bravado like the story of him threatening to reveal ‘the true history of the Jews in Egypt’ from writings he’d found in Tut’s tomb when upset at the British Counsel over tomb access problems I don’t know. Mind you if the latter is only nonsense, you might wonder if it was coincidence Gardiner wrote his articles on the exodus in the 1920’s JEA vols (remember he was the official epigrapher on the Tut tomb excavation). Perhaps in Gardiner’s papers in the Griffith (now the Sackler) lurks a translation he made of a certain roll unmentioned in the ‘official’ tomb catalogues???? LOL. Dear Peter, Thanks! Now that you mention it I dod remember that Carter had designs on the tomb – I’m going to have to go and look into this again!